A new study in the journal Social Problems by Junia Howell of the University of Pittsburgh and James (Jim) Elliott of Rice University in Houston concluded that when natural disasters hit, people of color not only bear the brunt of the damage, they also aren’t able to bounce back to the same degree as whites. Disparities such as these are critical to examine in light of what appears to be a permanent increase in climate change-induced natural disasters. 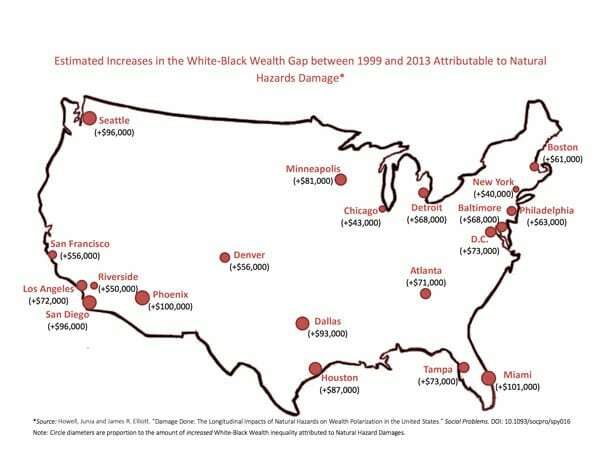 Howell and Elliott’s study, which covered the 1999 to 2013 period, found that in counties with at least $10 billion in damages from natural disasters, whites gained an average $126,000 in wealth per household following recovery efforts. Yet wealth among blacks, Latinxs, and Asians decreased by $10,000–$29,000. Elliott adds that the data show that “whites accumulate more wealth after natural disasters while residents of color accumulate less. What this means is wealth inequality is increasing in counties that are hit by more disasters.” According to a Rice University press release describing the study’s findings—to take just one example—in Harris County, Texas, which was hit by Category-3 Hurricane Rita in 2005 during the study period, the increase in the disaster-related wealth gap between white households and Black households was $87,000. Individuals who owned homes in counties that experienced high levels of natural disaster damage accumulated $72,000 more wealth on average than their counterparts in counties with few disasters. Renters, on the other hand, lost $61,000 in wealth on average relative to renters in counties with few natural disasters. And, for a host of reasons that can be traced back to a history of redlining and many other discriminatory practices that starkly restricted Blacks and other people of color from becoming homeowners, Blacks are far more likely to be renters than whites. A recent report by Harvard University’s Joint Center for Housing Studies found that 43 percent of Blacks in the United States owned homes in 2017, compared to 72 percent for whites.